Here is another great post from our nutritionist and his take on Collagen! You have probably heard of collagen from the skin cream adverts on TV. You know the ones where a quick cream application will make you look 10 years younger and there is a touched up image of a 40 year old claiming to be 60? Those ones. I have even heard of hair products and shampoos which contain collagen to give you ‘fuller and shinier hair’ or something like that. If they are going to the effort of adding and advertising collagen then it must be good, surely. Collagen is just a form of protein. It is known as a structural protein as it forms the main component of connective tissue. This means that proportionately it is a very high component in the make-up of our skin, tendons, ligaments, organs, and muscles, and makes up around 30% of the proteins in our body. -Wrinkles and less elastic skin. -Less flexibility in tendons and ligaments and increased risk of injury. -Digestive problems due to damaged lining of the intestines. -Joint pain due to worn cartilage. We don’t actually ‘need’ to get collagen from anywhere. Our body can synthesise collagen from other amino acids in our diet. Therefore, as long as we are getting enough protein in our diet, then we should be able to make collagen. However, we still might find reasons to want to increase the amount of collagen in our body. For example, rock climbing puts a lot of stress through the small tendons and ligaments in the fingers. Trying to boost collagen intakes to maintain tendon strength and hopefully reduce risk of injury would seem like a great step forward if this was part of your training! You will get small amounts of collagen protein in meats and eggs, but not really enough to make a difference. Bone broth is what you get when you boil the bones of animals, drawing out the proteins and minerals from the bone marrow. Admittedly this sounds a bit grim, but it is not really much different to making a stock. Simply take the bones after your roast dinner and leave them boiling for a full day. The resulting liquid can then be used for cooking in sauces and soups. I always try to recommend whole foods over supplements; however it just isn’t always possible. Collagen supplements can be bought in powdered form similar to other protein powders and mixed in milk shakes, yogurts or anything else that you might put whey in. Supplementing with collagen has shown some beneficial effects on tendon strength in research, however most of the studies so far have been done on mice so more research is needed in humans. Vitamin C is essential for the body’s production of collagen. Having a good daily supply of vitamin C from fruits and vegetables is a good idea if you want to keep your skin and joints healthy. If you choose to supplement with collagen, then eating some oranges alongside will help you to get the most out of it. It could just be another tool in the toolbox in our goals to age gracefully and healthily, and might help us in our future athletic endeavours. WARNING: This book will give you incredible amounts of energy, improved sleep, happiness, focus and the body you have always wanted! 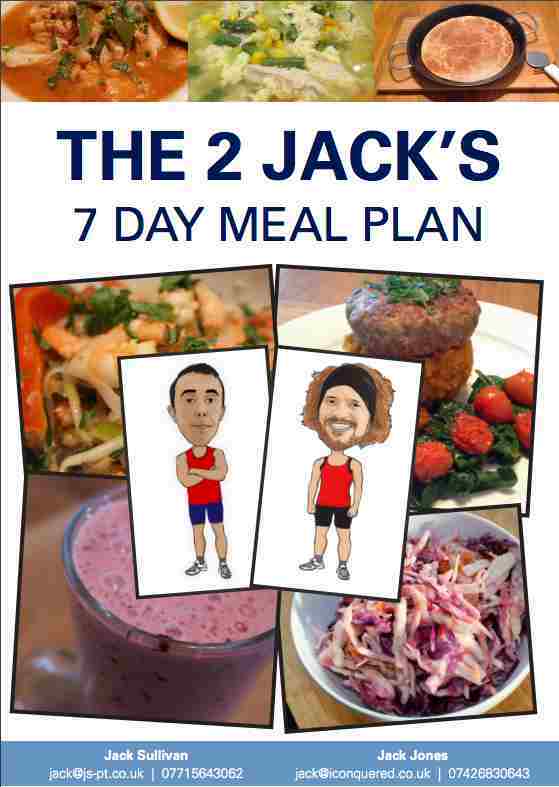 Get your 7 Day Meal Plan Now! Free 7 day meal plan! The body you have always wanted! With 10 years experience of training people of all ages and fitness levels we know no matter how hard you work in the gym, a poor nutrition programme will leave you short of the results you deserve. It’s easy to get confused when it comes to nutrition, separating fact from fiction is a nightmare for most. High protein, zero carbs, low/high fat, meal replacement, no food after 6pm.